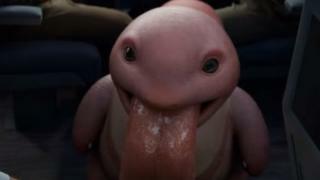 The latest footage from the New Detective Pikachu film shows off the licking tongue of, unsurprisingly, Lickitung! But it seems the CGI pocket monster has set tongues wagging, with fans unsure about its new realistic look. Now we know that in the cartoon, not all the Pokemon were cute and furry! Licaktung, for example is bright pink, bald and has a ginormous tongue - In the Pokedex, its tongue is described as being six-foot in length. But with the new live-action Detective Pikachu movie, Pokemon are being brought into the real world first time. That means lots of them have been given a less cartoony look and some fans say Lickitung's real-life look is actually a bit scary. Not all of the Pokemon in the new Detective Pikachu trailer look scary though. 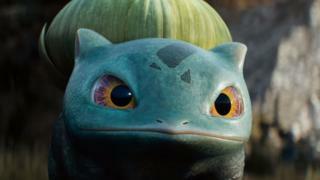 On face of it, Bulbasaur could be the stuff of nightmares, a frog like creature with a plant growing out of its back, but the little green Pokemon still manages to look adorable. Detective Pikachu, based on the Nintendo 3DS game of the same name, is in cinemas in May. New Pokémon games for Nintendo Switch announced! I think it looks weird, not in a good way but not necessarily in a bad way, either. Why do we have Easter eggs?